Here are two real-photo postcards, both showing the cottage that still stands at 11 Long Branch Avenue in Pigeon Cove. 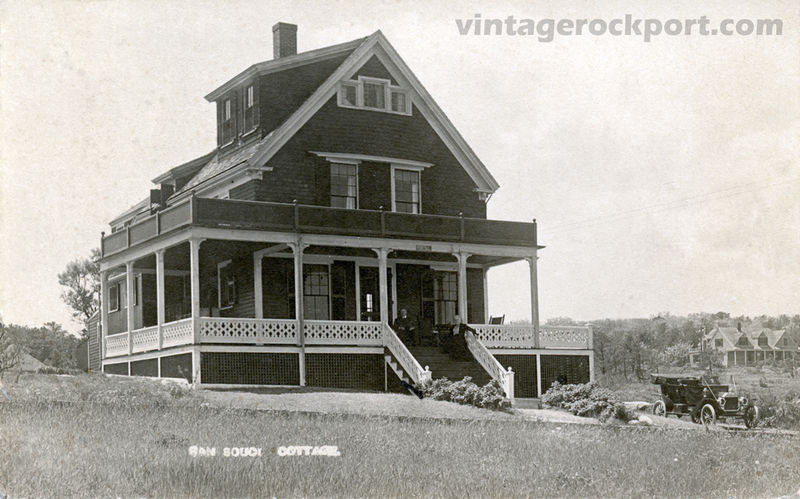 The second card identifies the cottage by the name Sans Souci. According to an online realty site, the house was originally built in 1875. The first card was postmarked in Pigeon Cove on Sept. 1, 1909. 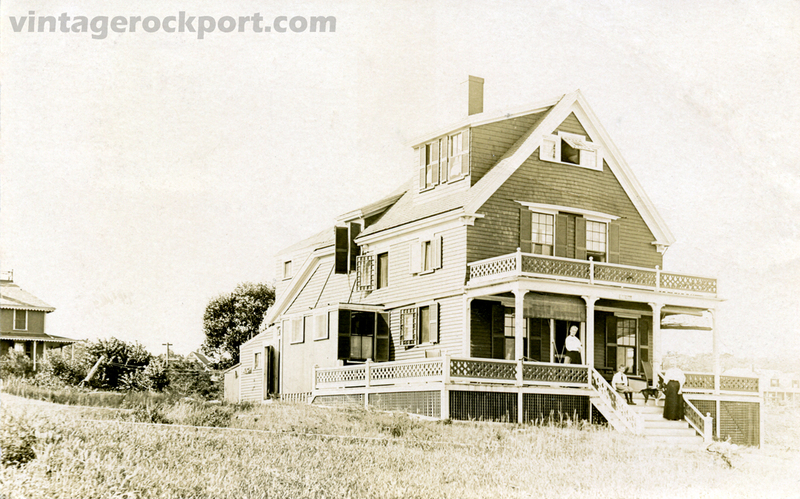 The sender of the card was a summer visitor to Rockport who was staying in a room on the top floor. On the front porch are two women, a boy and a dog. The second card is postmarked Aug. 2, 1913. 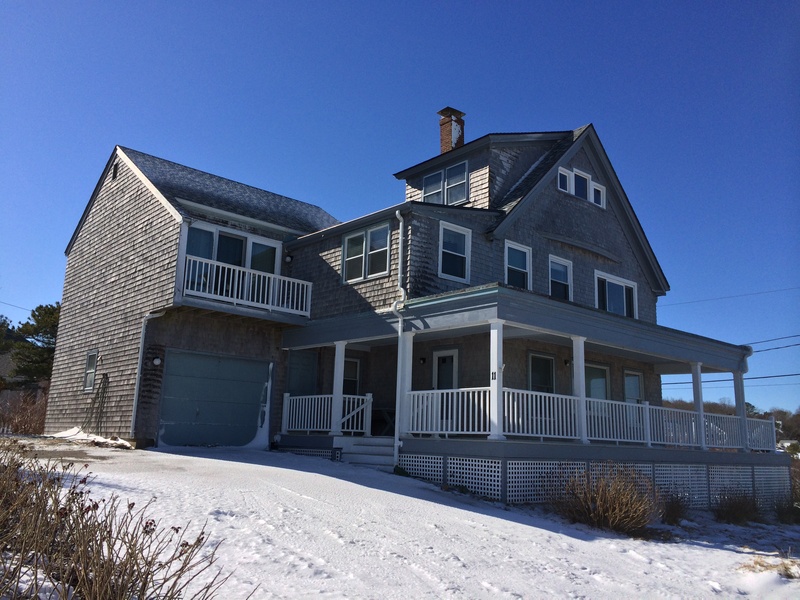 Note that the second-floor balcony has been extended to wrap around the side of the house. In this picture, a man and a woman are seated at the top of the entry stairs. A car is parked beside the house. 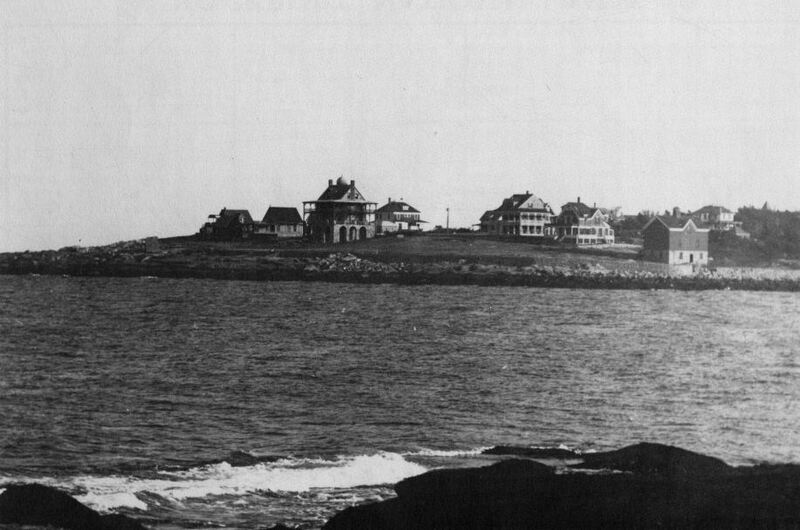 I found a reference to this cottage in the 1919 edition of Who’s Who Along the North Shore, indicating the cottage was occupied that summer by Mr. and Mrs. Fred Shorey of Los Angeles and their daughter-in-law Emily J. Shorey. At right is a picture of the house at it looks today. As you can see, it has been added on to. However, certain features remain distinctive, such as the three-framed window at the top of the house’s front, the slight bow below it, just above the second-floor windows, the dormer jutting out from the roof, and the chimney above it. In the undated picture below, which is from the Andrews Woods website, you can see the house on the right side of picture, to the left of the barn-like building closest to the water. This entry was posted in Uncategorized and tagged Pigeon Cove. Bookmark the permalink. What people called a “cottage” back then we would call a sizeable house today! My grandparents, Roger and Dorothy DiNapoli, resided in this home from approximately 1939-1963. I remember visiting them in the summers when I was a child. I have such fond memories of the home and surrounding area.